The RadLienarGaugeTicks element gives you the ability to easily show a scale. The properties can be set directly in the smart tag window. 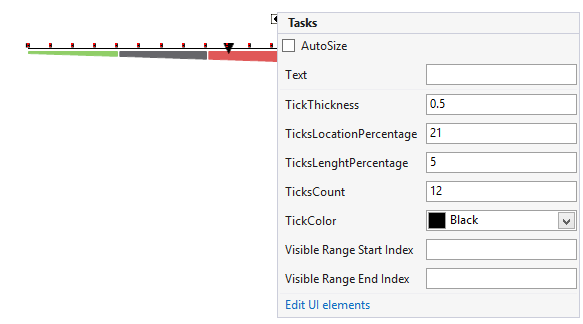 ThickThickness: Specifies how thick the ticks will be rendered. TicksCount: Specifies how many ticks will be displayed. ThicksLengthPercentage: Controls the tick’s length. ThickColor: Specifies the color of the ticks. TicksOffset: Specifies how far to the left/bottom the control will be shifted.